We are pleased to announce that the Winter 2017 issue of VESTED, CAPTRUST’s magazine for clients and friends, is now available. Subscribing clients will receive their copies in the mail the week of February 15. 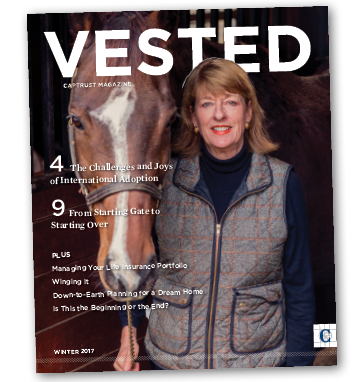 If you are interested in receiving VESTED, please contact your CAPTRUST financial advisor or email us at VESTEDMagazine@captrustadvisors.com. Check out our new resource center, which features wealth management articles, as well as the latest Investment Strategy and Market Thoughts.